The N8 will be Nokia's first Symbian device with a hardware graphics accelerator since the N82. While some current Symbian phones (Omnia HD, Satio and Vivaz) already have a graphics accelerator, they are hindered by the fact that S60v5 wasn't designed to make use of powerful hardware. 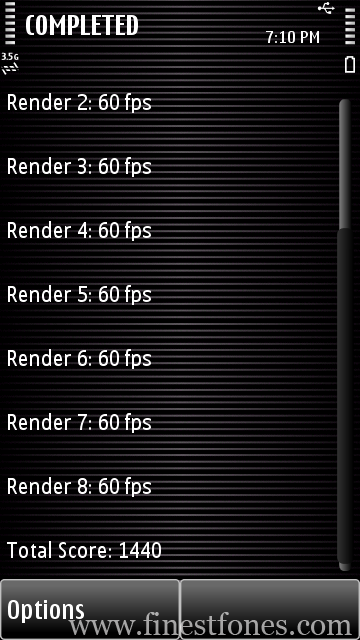 Symbian^3, on the other hand, is fully capable of taking advantage of the N8's GPU, and I've got the benchmarks to prove it. Note: The Speedy Go! test was conducted on the N8 firstly with 10 widgets running on the homescreen (five on the first page, five on the second and none on the third page). In that test, the N8 scored 777. The above screenshot was taken with 4 widgets on the homescreen. Please also keep in mind that this is a prototype N8; the software is not finalised. There's still plenty of room for improvement. EDIT: After some trial and error, the graphical compatibility issues have been bypassed and I can now show you a screenshot of the N8's results for FPC Bench 3D. In the video below, you can see how the N95 8GB and N97 handle the same test. The results are shown at around the 6-minute mark. I'm sure many of you have read opinions from people who've used the N8. Now that those opinions have been substantiated with benchmarks, how do you feel about the N8? This has sealed it for me. I'm buying a N8. Not sure how true this is but rumor has it that the application, Speedy Go!, gives inaccurate results because the test bases results on the speed of your application, not the "true" speed of the phone. People recommended trying the application "FPCBench" in addition and then compare results. What do you mean by the speed of application? I'm not quite sure. I tried calculating the first 2 million Fibonacci numbers using FPCBench but there seems to be some compatibility issues with the N8. 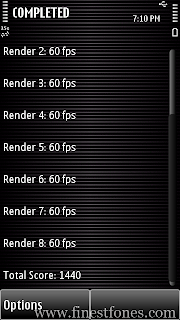 That's why I used FPCBench for the 3D test, as that worked after some tweaking. why the video is N97 vs omnia? why not n8 itself? I would have loved to have posted a video or even a picture. However, people with N8s have been instructed not to post content to the internet -- these benchmarks *shouldn't* be here. Because of this, I'm using screenshots to keep the chances of the N8 being traced to a minimum. I'll see if I'll be able to get some video content later. Speaking of which, what kind of N8 content would you like to see? I would love to see benchmarks on the USB 3.0 transfer rate, both wired and wireless. Also USB2go, specifically viewing 720p files on a thumbdrive being connected to a HDTV with n8 as host. That would be AWESOME. Also a desciption of how bad is the OLED screen in sunlight, I hear it's really bad. Some more pictures taken in the dark would be much appreciated as well. @DonJaG, I'll try my best to get some of what you requested, but keep in mind that I might not be able to deliver it all. You mean Nokia "can't" sell it because it runs Symbian ? Have you heard about Nokia 5800 and how much it sold ? And how is that If Nokia used Android instead will boost it sales ? Please kindly enlighten us with your knowledge on Operating System. I will patiently wait for what you can demo on the n8. Hey, how about this, my N82 got 377 unaccelerated and 429 on accelerated. This is indeed impressive. Having seen Need For Speed running recently, it is even more assertive that Nokia N8 is a tough competition for the Apple. I've bought Nokia N8 only few days ago but I am already more than happy with it. It has so much functions and the price is relatively low. I am really happy about it. As I see the post is written in 2010 but in my country this phone is almost new in 2011 :) Thanks for the post! wow ... This article is very nice, and I think your article worth reading public. I would like to see more helpful reply post in your blog.